I am going to provide the most frequent queries you can expect to be asked while going for the Wordpress job interview. These questions are asked by many popular companies in the interview round to the candidates applying for the job of CMS developer or WordPress Developer. 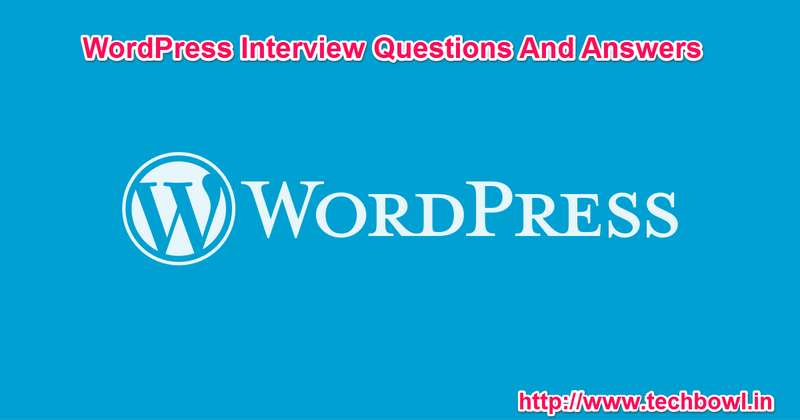 Many queries in this post are really tricky and can confuse even the professional developers so if you are going for the job interview then I highly recommend you to check these latest WordPress CMS interview questions and answers. Word press is a best Open Source CMS which allows it to be used free of cost. You can use it on any kind of personal or commercial website without have to pay a single penny for it. It is built on PHP/MySQL (which is again Open Source) and licensed under GPL. The word press is safe to operate but still it is suggested to keep updating with the latest version of WordPress to avoid hacking. You can use WordPress for e-commerce sites, membership sites, photo galleries and any other type of site you can think of. The web site is created using the same html code as any other site so there are no limitations there either. WordPress was originally used as blogging software though it has since become popular for website also. It is not necessary to have a blog to use wordpress. Still having blog is commendable as it will help in search engine optimization. It is one of the benefit of using wordpress, it has inbuilt SEO search engine. Also, you can have an additional plug-in in wordpress to help with SEO and rank on a popular search engine like Google. You need to quote the current version of WordPress available in market along with the release date. Hooks allow user to create WordPress theme or plugin with shortcode without changing the original files. Action hooks allow you to insert an additional code from an outside resource, whereas, Filter hooks will only allow you to add a content or text at the end of the post. Custom field is a meta-data that allows you to store arbitrary information to the wordpress post. Through custom field extra information can be added to the post. MySQL is widely available database server and is extremely fast. It is an open source and it is available at no cost also it is supported by many low-cost Linux hosts so its easy for anyone to host their website. To display post WordPress use PHP code, this code is known as loop. If you go on dashboard under options-discussion there is a comment “ Allow people to post comment” try unchecking the comment. In WordPress template tags is a code that instructs WordPress to "do" or "get" something. You can’t see your plugin menu when the blog is hosted on free wordpress.com as you cannot add plugin there. Also, if you do not have an account of an administrator level on your WordPress is not possible to see plugin. Some WordPress users wants their WordPress installation to be more than a blog site. To give their page a look more like a real website page some users use static front page. To create a contact form in WordPress you can use plugin like Gravity forms or also you can use a free plugin contact form 7. While using widget you have to ensure whether your theme supports the widget and if it does then it must show the sidebar. If in any case if it happens that you don’t see the sidebar then it might be missing the “function.php” file or file similar to that. This can also happen if you have forgot to save the changes in the widget or refreshing the older display of the page. Most of the things are similar in both except the choices of themes and the usage of plugins. WordPress.com is considered more secure than wordpress.org because they limit the themes and also does not allow installing plugin’s. However the security is more dependable on how the hosting company is hosting your website(wordpress.org) & also what are the steps they are taking to prevent the security problems. Sites requiring custom scripting solutions. How Custom theme is different than Normal theme? Custom theme allows for SEO search, but with a SEO plugin available it would not make much difference to normal theme. One benefit using the Custom theme is that it allows to make the changes without going much into the coding part. To create a static page in wordpress, in the page section you have to upload a php files to the server in the theme folder, and then select that as your template. This allows you to add any page and look that you wanted for your blog and it will remain static. Keeping all the limitations in mind, WPML would be the best multi-lingual plugin for wordpress . What should one use for plugin development - custom post types or custom database tables? There is no specific preference for plugin development; it depends on what type of plugin’s one has to develop. Though few recommend custom post type, as it has few benefits comparison to custom database table.